We live in a world and in a time where chaos is very real, but we must not give up. We must not give in. Our call is to follow Jesus of Nazareth. And he calls us into God’s future, into God’s dream of our becoming God’s beloved community. 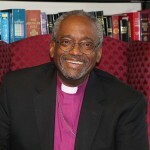 Watch above: Presiding Bishop Michael Curry of The Episcopal Church greets the people of the Episcopal Diocese of Central New York on the occasion of the 150th anniversary of the establishment of the diocese. Congratulations, Central New York, on the 150th anniversary of the founding and the establishment of this great and historic diocese. It’s a joy to bring you greetings as you gather in Convention with your bishop, Bishop DeDe Duncan-Probe. It really is a joy and a privilege to say a word of encouragement and thanksgiving for what you are doing. I can’t think of a better way to celebrate, to rejoice, to give thanks for a noble and honorable past following in the way of Jesus and at the same time to pivot and turn into the future that God has already begun among us following in the way of Jesus. I can’t think of a better way to do that than the work you are doing creating beloved community following the way of love that Jesus teaches us. Dr. Martin Luther King once said “We will either learn to live together as brothers and sisters or we will perish together as fools… The choice is ours, chaos or community.” We who follow the way of Jesus of Nazareth, we who believe in him and his way, we who are committed to the way of love, its practices, its disciplines, its teachings, we choose community, not chaos. We live in a world and in a time where chaos is very real, but we must not give up. We must not give in. 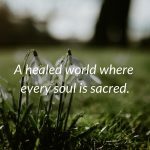 Our call is to follow Jesus of Nazareth and he calls us into God’s future and he calls us into God’s dream of our becoming God’s beloved community, beloved community where there is plenty good room for all of God’s children, beloved community where there is no more suffering that can be prevented. God’s community where all of us are treated as children of God, equal in the eyes of God and before all, the beloved community where there’s plenty good room for every one of us and all of God’s creation. Central New York, thank you. Thank you for having the courage and the faith and the fortitude and the will to work to become the beloved community following the way of love that our Lord Jesus Christ has taught us. God love you. God bless you and may God hold us all in those almighty hands of love.